The first recipe I ever cooked was pikelets*. I was about ten and eager to help out in the kitchen, sensing even then that the kitchen was where all the action was. My mother was a good, plain cook; hospitable and always concerned that there might not be enough food to feed her guests. Her hand written recipe book had two recipes for pikelets, but the one from her friend Shirley was always the one she made. I can remember still the thrill of making them ‘all by myself’ and the happiness I felt when my family ate them all up. That was the beginning of my cooking journey – cooking for the love of food and the people I love. My mother died last year and as I was going through her things I found that old recipe book. A flood of warm memories washed over me when I turned the faded pages; both of cooking these old fashioned recipes and of my gracious and lovely mother. Next time you are preparing afternoon tea, why not make these pikelets. They are best served warm with jam and a dollop of cream and a cup of tea (in a cup and saucer, not a mug!) And if you have a daughter or a son, get them to make them with you. Put the eggs, sugar, flour and milk into a large bowl and whisk together until well combined and you have a fairly thick batter. Heat a flat frying pan on a medium heat (my mother always used her Sunbeam electric frying pan, and I do too). Put in a little butter and then drop tablespoonfuls of mixture into the pan. Hint: if you drop the mixture off the side of the spoon the pikelets will be oval shaped; off the tip of the spoon will give perfect circles. When bubbles appear on the surface, carefully flip them over and cook for a minute more before taking out of the pan. To keep the cooked pikelets warm, wrap in a tea towel while you cook the remainder of the batter. *For those outside of Australia and New Zealand pikelets are most likely unknown. They are actually similar to pancakes, although much smaller (about 3 inches or 7.5 cm across) In Scotland they are sometimes called drop scones. Not eaten at breakfast, only for morning or afternoon tea. 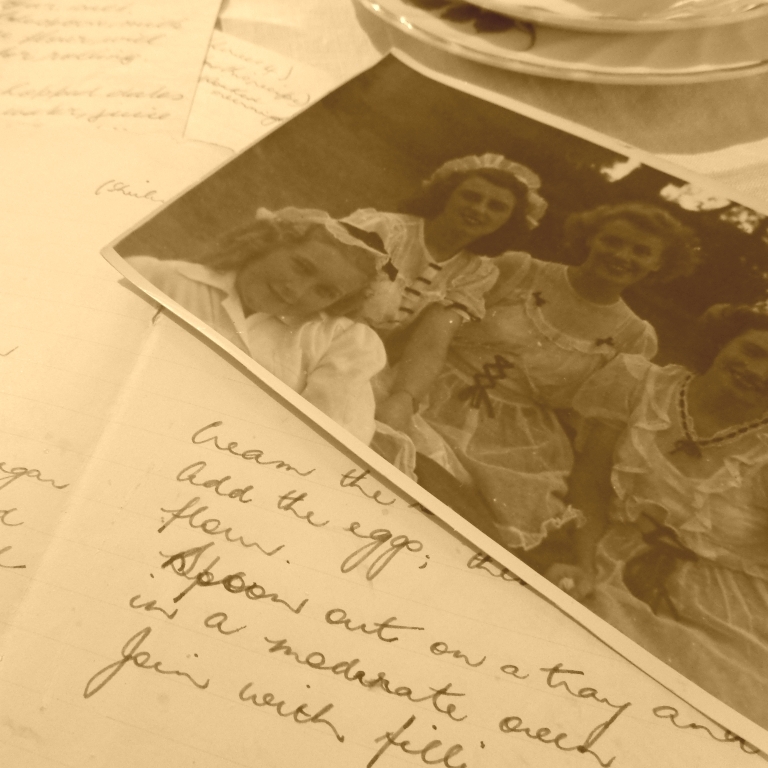 Memories can be wonderful things – I have many kitchen moments stored with my mum and Nanna. However, having two sons, I would recommend not ‘if you have a daughter, get her to make them with you’, but ‘daughter or son’. My boys love getting involved in the kitchen – and it is good to bring boys up to be capable in the kitchen for themselves, and any future partners! Thanks for the spoon hint on ovals or circles – very useful. Thank you so much for your comments. I feel keenly the loss of my mother (in the photo in the post she’s the lovely brunette second from the left) especially at this time of year, and I want to leave my children a storehouse of beautiful memories around the cooking and serving of food and the importance of family. My mother was English, and we grew up on ‘drop scones’. I never knew them as pikelets until I was probably 6 or 7 years old. A much better name I think, than pikelets. I liked that the name suggested scones that had been dropped, and gone flat! South Africans will know these as crumpets. Always a winning tea time treat. How interesting. We know crumpets as something completely different. I love the way the same food gets called a different thing depending on where you are from. 🙂 So great to have friends who love what I am doing. lovely post, I can hear your voice. Love the recipe, memories, photo and the handwriting! What a lovely memory. It reminds me of both my own earliest cooking experience (yes it was pikelets from my mother’s hand written recipe book) and more especially what a warm lady your mother was.